Illustrated (NRSV) Lectionary readings from Vanderbilt Divinity Library. The preacher might compare Jesus’ very different view of the “end times” with modern conceptions in the popular sci-fi film genre such as: Armageddon; Melancholia; The Core, or Deep Impact. Ed Mc Nulty, Visual Parables. Preaching This Week at WorkingPreacher.org, Luther Seminary, 2014. 2008. Commentary and Spiritual Perspectives, Advent 1B, 2014. Commentary, historical background, poems and readings. Center for Liturgy, St Louis University. Español. "Images of Hope, Suffering and Vigilance," D Mark Davis, Left Behind and Loving It, 2014. Faith in Process, Real Spirituality for Real Life, David Grant Smith, 2017. Preaching Helps and Worship Resources, Rev. Dawn Chesser, Taylor Burton-Edwards, Dean McIntyre, Prayers, Lectionary Hymns, United Methodist Church General Board of Discipleship, 2014. Disclosing New Worlds, Advent 1B, commentary and reflections, Lawrence Moore, 2014. "Two Sided Coin," Kathryn Matthews Huey, Sermon Seeds, SAMUEL, UCC, 2017. Starters for Sunday, November, 2014. Thoughts on Readings, Prayers & Hymn Suggestions. Office for Worship, Doctrine and Artistic Matters, Church of Scotland. Lectionary at Lunch: MP3, Windows Media, and Real Audio files of lectures by professors at Concordia Seminary, St Louis, MO (LCMS, 2014). The Lectionary Lab, Advent 1B, the Rev'ds Dr. John Fairless and Delmer Chilton (aka "Two Bubbas and a Bible"), 2011. Girardian Reflections on the Lectionary, Advent 1, by Paul Nuechterlein & Friends. Jesus Now, Advent 1B, lectionary, study and worship resources from Faith Futures Jesus Then & Now. Rumors, for November 30, 2008, Ralph Milton, "Sermon helps for preachers with a sense of humor." Living by the Word, Dennis Sanders, The Christian Century, 2017. "A Present-Tense Advent," David Lose, ...in the Meantime, 2017. Wild Lectionart: Learn from the Fig Tree, Jessica Miller, Radical Dischipleship, 2017. "The Wake Up Edition," commentary and discussion, RevGalBlogPals, 2017. Saturday Night Preachers Party. "All Your People," Sermon-Stories.com, 2017. Lectionary Greek, Mark13:24-37, Rob Myallis, 2017. "Wake, Wide Awake, and Woke," Sharon R. Blezard, Stewardship of Life, 2017. "Poetry from Prison: Advent Hope," Liz Milner, Journey with Jesus, 2017. "The Politics of Sleep," Amy Allen, Political Theology Today, 2017. Provoking the Gospel, Richard Swanson, 2017. "Rain, Steam, Speed," Lynn Miller, Art & Faith Matters, celebrating our creative and living God by generating art and architecture resources for congregations and individuals. Art and Faith Matters facebook page contains additional resources. "Advent Time," Karoline Lewis, Dear Working Preacher, 2017. "Showing up for good news and bad," Robert Warren, Christ Church Clermon-Ferrand, 2017. Lectionary Ruminations, John Edward Harris, Summit to Shore, 2017. "Seeking to bleat like a sheep," Andrew Prior, 2017. A Plain Account, Wesleyan Commentary, 2017. "Remember Your People," Bob Cornwall, Ponderings on a Faith Journey, 2017. "Wait for the Lord," Janice Love, Ekklesia Project, 2017. "Wake Up!" Connections, Next Sunday Resources, 2017. "Raking in the Dark," Janet H. Hunt, Dancing with the Word, 2017. Exegesis, Terrance Callan,Mount St Mary's Seminary, 2017. "No Longer At Ease in the Old Dispensation," Nancy Rockwell, The Bite in the Apple, 2017. "Good News of the End," Glenn Monson, Law & Gospel Everywhere, 2017. "A Decade at the Advent Door," Jan Richardson, 2017. Notes, Pastor Dan Bollerud, Christ Our Savior Lutheran Church, Anchorage, AK. Meditations & poetry, 2017. "Preaching a Participatory Advent," David Lose, ...in the meantime, 2014. "Hope in the Dark," commentary and discussion, RevGalBlogPals, 2014. "It's that time again: depression and the holidays," Barbara Lundblad, ON Scripture, Odyssey Networks, 2014. Video: 5 Things You Didn't Know about Depression. "Advent on the Mind," Karoline Lewis, Dear Working Preacher, 2014. "Hard Gifts," Debie Thomas, Journey with Jesus, 2014. 2011, 2008 by Dan Clendenin. "Blessing When the World Is Ending,", The Advent Door, Jan Richardson, 2014. 2011. Use of images. 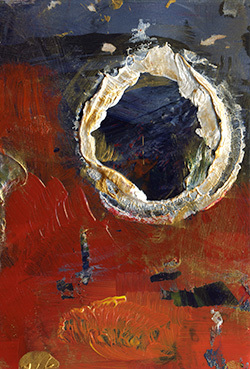 "Awake, Awake, the Son of Man Is Coming," Bob Cornwall, Ponderings on a Faith Journey, 2014. "Stewards of Advent Time: Awake," Sharron R. Blezard, Stewardship of Life, 2014. 2011. "Advent 1: Hope," Peter Lockhart, A Different Heresy, 2014. "Has God Hidden?" Beth Scibienski, 2014. "Christmas, Apocalypse, Rebels and Bell Choirs," Russell Rathbun, Question the Text, 2014. "I Am Waiting for a Rebirth of Wonder," Bob Stuhlmann, 2014. "Watching and Waiting," Janet H. Hunt, Dancing with the Word, 2014. Lectionary Ruminations 2.0, John Edward Harris, Summit to Shore, 2014. 2011. "Watching and Waiting," Suzanne Guthrie, Soulwork toward Sunday: At the Edge of the Enclosure, 2014. "Watch Actively!" Thomas Beam, 2014. "New Life There," Andrew King, A Poetic Kind of Place, 2014. "Getting Ready for Tomorrow," Steve Goodier, Life Support System, 2014. "If the World Were to End," David Lose, Dear Working Preacher, 2011. "#OccupyAdvent: 'Let the Reader Understand'," Carl Gregg, Patheos, 2011. "Don't Miss the Last Train Home," Neil Chappell, a weird thing, 2011. "Who put the 'i' in Surprise?" Peter Woods, I Am Listening, 2011. "Cycle Repeated," Miriam's Tambourine, Memphis Theological Seminary, 2011. "Shattering Skittishness," "Star Gazing," Fr. Rick Morley, a garden path, 2011. Sermon Notes for November 27, Michael Rich, In-Formatio, 2011. "Emergency Alert System," Alyce M. McKenzie, Edgy Exegesis, Patheos, 2011. "Keeping Awake to Wait," David Henson, Patheos, 2011. "One Candle," Melissa Bane Sevier, Contemplative Viewfinder, 2011. "Falling Stars, Failed States, and the Power of Advent," Amy Allen, Political Theology, 2011. Dylan's Lectionary Blog, Advent 1B. Biblical Scholar Sarah Dylan Breuer looks at readings for the coming Sunday in the lectionary of the Episcopal Church, 2005. "This Little Piggy Got Broken," by Michael Renninger. A Sermon for Every Sunday. Video sermons from America’s best preachers for every Sunday of the Liturgical Year. "Apocalypse, Not Now," Bob Baggott, Day1, 2017. "Never Mind the Width," Samuel Wells, Faith and Leadership. 2014. "Reading the Signs on our Journey," Rev. Timothy G. Warren, Sermons that Work, Episcopal Digital Network, 2014. 2 Adviento (B) – 2014 POR EL RVDO. GONZALO RENDÓN, Sermones que Iluminan, Episcopal Digital Network, 2014. Reading the Signs on our journey, Rev. Timothy G. Warren, Sermons that Work, Episcopal Digital Network, 2014. "Mark," Frederick Buechner Sermon Illustrations. Ministry Matters, November 30, 2014. "Two Minute Warning," the Rev. Dr. Russell Levenson, Jr., Day 1, 2011. Göttinger Predigten im Internet: Every Sunday Sermons based on the RCL by a team of Lutheran theologians/ pastors, 2011. "Our Hope, God's Faithfulness," the Rev. Dr. Kenneth Carter, Day 1, 2008. "Christ Is Among Us," Weekly Seeds, UCC, 2014. Bible Study, Advent 1B, 2014, Ben Maddison, Sermons that Work, Episcopal Digital Network. Estudio de la Biblia. Adviento 1B, por Ben Maddison, Sermones que Iluminan, Episcopal Digital Network, 2014. "Restore Us, O God," FaithElement discipleship system "setting the Bible free," 2011. The Text This Week's Advent Resources Page. Interactive Alternative Worship Ideas, Emmy Kegler, 2014. The Worship Closet, Creative Worship Ideas, 2011. Advent 1: Hope, The Rev. Dr. John Tamilio III, PhD, 2011. Mustard Seeds, "Waiting, Hoping, Expecting," Advent 1, 2017. A lectionary-based ideas resource for leaders of contemporary worship, Ann Scull, Gippsland, Australia. LCA Worship Planning Page, Advent 1B, 2014, "Everything lay-readers need to prepare worship"
Lectionary Liturgies, Advent 1, Thom M. Shuman, Presbyterian Church (U.S.A.), 2014. Worship and Liturgy Resources, Advent 1 by Rev David Beswick, Uniting Church in Australia. Advent Liturgy / Advent in the Southern Hemisphere, Rev. Bosco Peters, New Zealand. Ideas for Sundays in Advent, The Rev. Thomas L. Weitzel, ELCA. Advent and Christmas Resources, Katherine Hawker, Outside the Box. Lector's Notes, Advent 1, Gregory Warnusz, Saint Jerome Parish, Bellefontaine Neighbors, MO. Notes and commentary for those reading this week's lectionary texts to the congregation. Call to Worship, November 27, 2011, Mary Jane Konings, Timaru, New Zealand. The Timeless Psalms: Psalm 80:1-7, 17-19, (Advent 1B), Joan Stott, prayers and meditations based on lectionary Psalms, 2017. Sunday Prayer, Advent 1B, RevGalBlogPals, 2011. Worship Ways, prayers and liturgies, UCC, 2014. HermanoLeón Clipart, Advent 1, Free clipart, backgrounds, slides, etc. Clip Art, Advent B1, Fr. Richard Lonsdale, Resources for Catholic Educators. 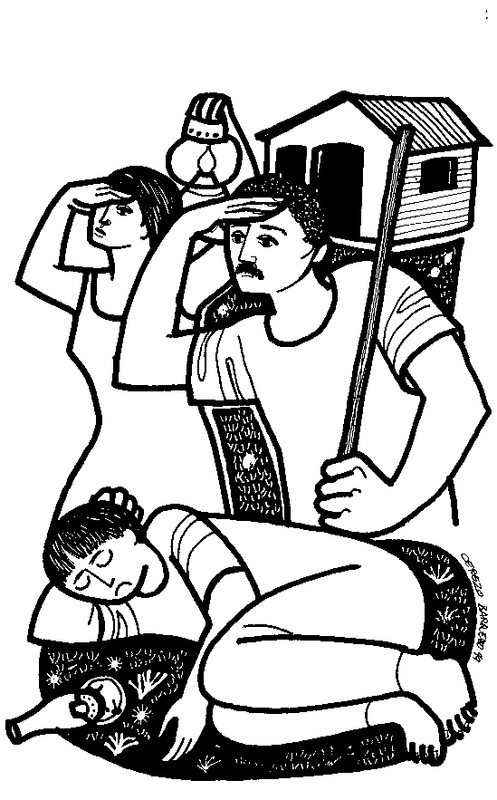 Clip Art Images: Mark 13:33-37, Misioneros Del Sagrado Corazón en el Perú. Advent 1B at Cerezo Barredo's weekly gospel illustration. Follows Latin American Roman Catholic gospel reading, though most gospels texts/themes are found in the index. Liberation emphasis. "Stay Awake for the Lord's Coming!" Advent 1. Flash presentation of this week's scripture texts. Performance Commentary of Mark 13:24-37, Advent 1, Lynn White of the Network of Biblical Storytellers, You Tube. "Calendar," John Stevens, Dollar Store Children's Sermons, Video, 2014. Free PowerPoint, etc images, CHURCH galleries, Dorothy Okray. “Open Wide Your Heavens!,” an original hymn by Carolyn Winfrey Gillette on Isaiah 64. This hymn was commissioned by The Presbyterian Outlook magazine for new Advent hymns to Christmas carol tunes. Tune: CRANHAM (“In The Bleak Midwinter”). “There is a Mighty Question,” an original hymn by Carolyn Winfrey Gillette on Jesus’ teachings about the end times and was selected to be in the Calvin Institute of Christian Worship’s Singing the New Testament. Tune: ANGEL'S STORY 7.6.7.6 D (“O Jesus, I Have Promised”). “God, You Alone Know What You've Planned,” an original hymn by Carolyn Winfrey Gillette. This hymn was commissioned by The Presbyterian Outlook magazine for new Advent hymns to Christmas carol tunes. CAROL 8.6.8.6 D (“It Came Upon the Midnight Clear”). "The Lord's Messiah Comes,", a hymn for Advent by Rev David Beswick, Uniting Church in Australia. "Angels Came Singing," "How Long We've Waited," Brenton Prigge, NewHymn. Psalm Settings by Dale A. Schoening, Metrical Psalms, Psalm 80:1-7, 17-19 set to The Solid Rock (88 88 888). Hymn and Song Suggestions, Advent 1B, 2017, annotated suggestions from Natalie Sims, Singing from the Lectionary. Shepherd Sounds, Advent 1B, Background information for hymns and choral music following the lectionary from the Episcopal Church of the Good Shepherd, Austin, Texas, by Eric Mellenbruch and David Zersen. Lectionary Hymns, Advent 1B, National Association of Pastoral Musicians. Choral Anthem Project, Advent 1B, National Association of Pastoral Musicians. Sing for Joy, Advent 1B, 2008. Choral reflections on this week's lectionary readings, St. Olaf College. Worshiping with Children, Advent 1B, Including children in the congregation's worship, using the Revised Common Lectionary, Carolyn C. Brown, 2014. 2011. Highlighting the Chrismon Tree 2014, Fran Woodruff, On the Chancel Steps. "The Fine Art of Waiting," Dianne Deming, Children's Sermons Today, 2011. Faith Formation Journeys, childrens sermon, 2011. "Advent and Christmas Eve, 2011," Frances Woodruff, On the Chancel Steps.